These beautiful and colourful Asian wedding flowers at Farnham Castle, are a great example of how lovely a splash of brighter colours can look at Farnham Castle. Hanaa loved a mix of vintage style blooms but was concerned that if she opted for a paler ivory and blush colour blend, the flowers would not have enough standout against the pale background fabric of the venue, and would be out of character with the beautiful saris that the guests will be wearing. 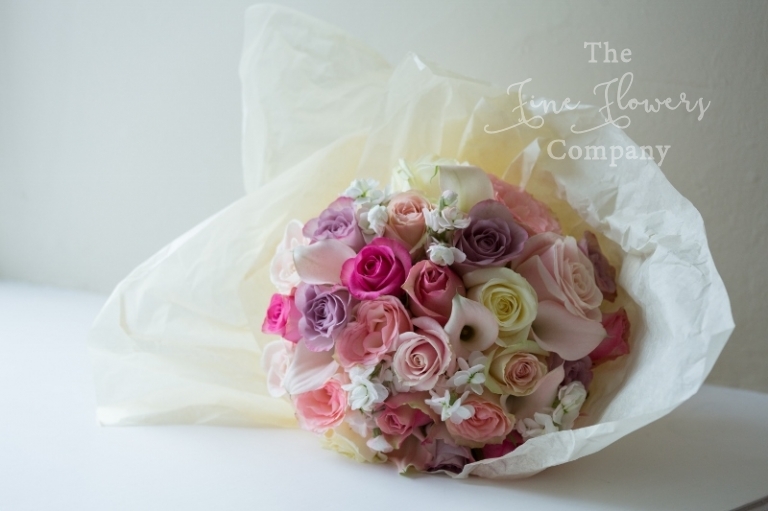 We therefore put together a blend of classic English garden flowers such as roses, hydrangeas, scented stocks, and injected subtle accents of deeper colours to give a more vibrant take on ivory and blush. 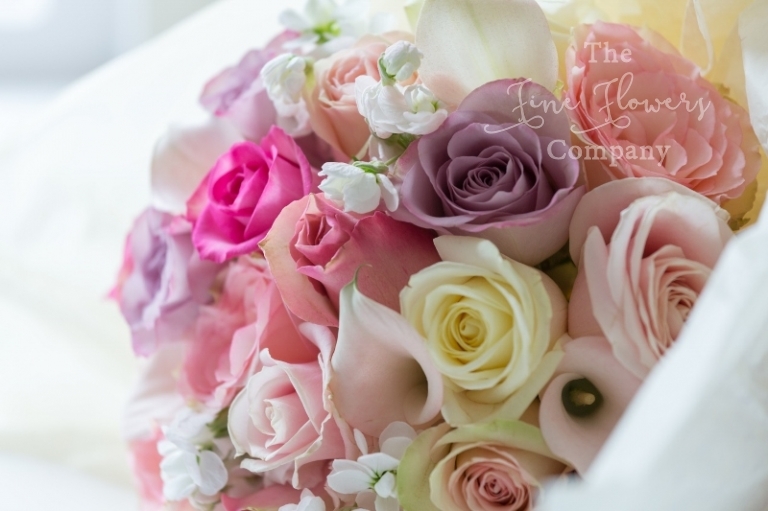 The result was a pretty and textural look which suited the venue as well as the mood of the day to a T.
Hanaa and her bridesmaids carried beautiful bouquets of ivory, blush, pink and lilacey pink roses, with blush calla lilies and scented stocks added just to Hanna’s bridal bouquet. 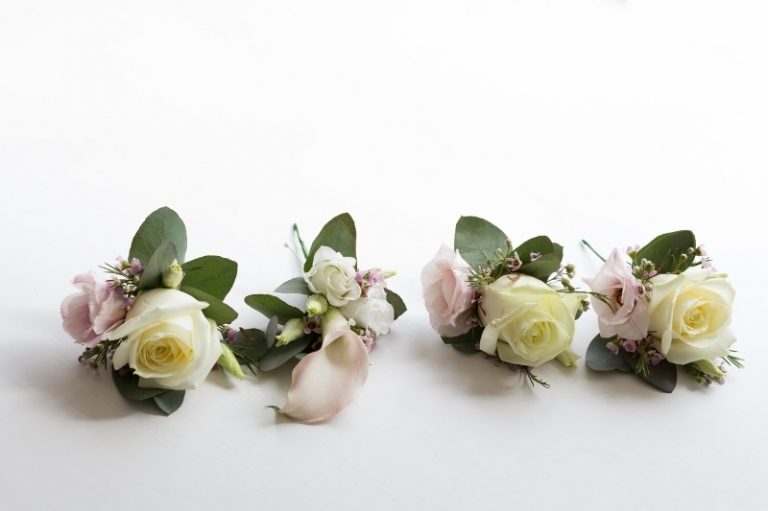 The mens’ buttonholes were matching roses with blush lisianthus for the ushers and best man, and calla lily and spray rose and lisianthus for the groom. For the venue, all ceremony room flowers were later on reused in their entirety for the wedding breakfast – the tall guest table silver stemmed centrepieces, with bloomy displays of roses, hydrangeas, scented stocks and lisianthus, were used first on plinths, to line the aisle and then used on the guest tables to give much needed impact in the tall ceilinged great hall. The flowers used on the ceremony table, together with the bridesmaids bouquets, placed in matching vintage silver vases, were dotted along the front of the top table, keeping them fresh until the next day to enjoy them even longer. For more real featured weddings at Farnham Castle please visit our Farnham Castle wedding flowers gallery pages to see what looks best at this beautiful venue. 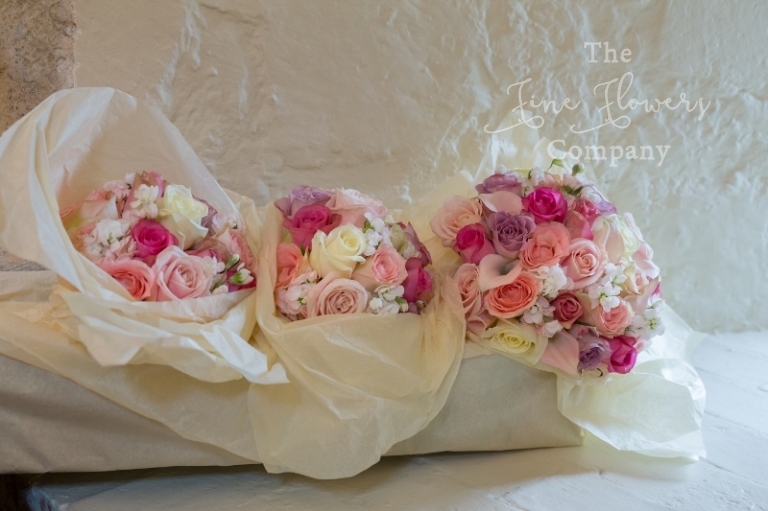 We are recommended florists at Farnham Castle and would be delighted to help you plan your wedding flowers, whatever your theme. In the meantime, please enjoy some more beautiful shots of these lovely Asian wedding flowers at Farnham Castle, with special thanks to Schutters Photography.